It won’t take a rocket scientist to observe that there is something of a disconnect in our current education system. Author and environmental educator David Orr calls it a “crisis of education,” where concepts and disciplines are taught with little hands-on application in the real world and with little insight into their overall impact on ecosystems. Aiming to put the hands-on component back into pedagogy, Jeff Wilson, an environmental science professor and dean at Austin, Texas’ Huston Tillotson University, is launching the Dumpster Project, which will feature him living out of a dumpster for a year, starting this fall. Professor Dumpster will be spending one year in a dumpster that is approximately 6 feet x 6 feet, or about 1% the size of the average new American home in 2011. Every element of the dumpster will present a stark contrast to the consumption levels of the average American lifestyle. It will be a “net zero” model, meaning that it will consume only as much electricity as it produces through solar panels. Innovative systems will also be developed for water filtration, climate control, and waste reduction. 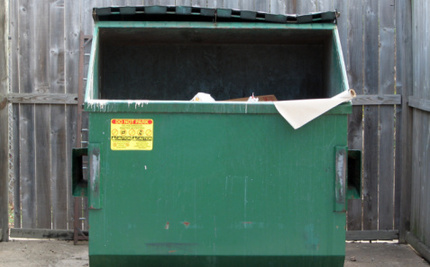 Professor Dumpster will be relying on creative collaboration from the greater international design and education community to help outfit the dumpster with everything he’ll need to live comfortably in an intense central Texas climate, where average summer highs are in the high-90s. Keeping that secret for seven months, especially from the 3 a.m. cleaning staff and 24-hour security, much less the students and my colleagues, was interesting in itself. Now, with the help of his students in tackling the issues of how to power the dumpster home, take care of water, waste and indoor air quality, the self-styled “zany professor” hopes to demonstrate that living comfortably with a lot less is very possible. It has already debuted in New York City’s Maker Faire, and once it’s completed, Wilson also intends to take the retrofitted dumpster on educational tours for all grade levels. This is a project with a lot of potential for capturing the imagination of the next generation; more over at the Dumpster Project blog. Good luck to professor Dumpster. It takes guts to change your life around but to teach others it takes example. Kudos to this brilliant professor! He will accomplish much by "living" his discipline. Students everywhere will love it. Wonderful man! Please let us know how this goes - and I understand that Texas can be prone to bad weather of all sorts and extremes, not just summer heat - how's the insulation on that dumpster? ?